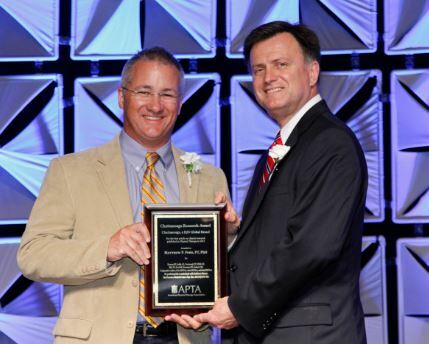 Associate professor and chair of Samford University's Department of Physical Therapy, Matthew P. Ford, PT, PhD, received the America Physical Therapy Association's Chattanooga Research Award during the association's NEXT Conference & Exposition held in Charlotte, North Carolina, June 11-14, 2014. Ford has served on the School of Health Professions faculty since December 2013. The research article for which he won the award appeared in the April 2013 issue of Physical Therapy and is titled "Comparative Utility of the BESTest, Mini-BESTest, and Brief-BESTest for Predicting Falls in Individuals with Parkinson Disease: a Cohort Study." "It was a nice honor to receive this award," said Ford. "We thought the message in this paper was very useful to physical therapists working with persons with Parkinson Disease and it's great to see that colleagues agree with us." The Chattanooga Research Award honors individuals who publish the best articles on physical therapy research in Physical Therapy. Articles must demonstrate a significant contribution to physical therapy, present a novel and innovative research study or theoretical model that addresses an important area of physical therapy, have a clearly stated purpose with supportive rationale and appropriate methodology, and clearly present the results and/or theoretical framework with appropriate discussion of application and impact on clinical practice or future physical therapy research. Samford's Department of Physical Therapy is now accepting applications for its first cohort of students, set to begin in summer 2015. Learn more about the program and admission.